We first reported in 2007 of Walrus pushed off Arctic sea ice due to unusually an unusually low Arctic sea ice extent in the eastern Chukchi Sea, where they normally spend their summers breeding and feeding in the shallow waters of the continental shelf. For the third time in the past four years Walrus again find themselves forced onto land due to retreating sea ice. This year marks the third lowest Arctic sea ice extent since sattellite monitoring of seasonal sea ice melt began, according to the National Snow and Ice Data Center in Boulder, Colorado, continuing the trend toward an ice free summer for the Arctic. Thus far 2010 is tied with 1998 as the warmest year on record. The disappearing ice and warming climate is bad new not only for walrus, but polar bear and other marine mammals that depend on the northern ice. Recent reports from the US Geological Survey have shown between ten and twenty thousand Walrus have congregated in a “desne clump” at Point Lay, Alaska. Forced onto land, feeding becomes more difficult and raises concerns that the easily spooked animals will stampede, say wildlife experts. With adult female Walrus typically weighing in at about one ton, the risk is greatest for the younger members of the group. Last year 131 Walrus were trampled when they sought shelter from retreating ice along the shore of Icy Cape, Alaska. Most of the animals killed were juveniles. Similar reports of deadly stampedes have also been reported in the Russian Arctic. In response to the propensity of Walrus to be easily frightened, a buffer zone has been suggested by the Fish and Wildlife Service (FWS), asking ships to maintain a distance of one-half mile from the coast and airplanes to maintain an altitude of at least 1500 feet and lateral distance of one-half mile. The FWS is in the process of considering protecting the Walrus under the Endangered Species Act, and must decide whether or not to proceed with listing by January of 2011. Couldn't floating walrus refuges be made out of Pykrete? It seems few people are concerned enough about global warming to reverse the trend. 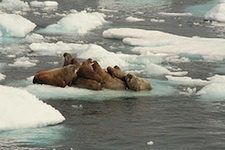 Some articial ice floes would give the walruses a respite while the debate goes on.